For months it has been speculated that researchers may have finally created crystals of time – strange crystals that have an atomic structure that is repeated not only in space but over time, putting them in perpetual motion without energy. Now it’s official – researchers have detailed information on how to make and measure these strange crystals. And two independent teams of scientists claim that they actually have created time crystals in the laboratory based on this plan, confirming the existence of a whole new form of matter. The discovery may sound very abstract, but it heralds a new era in physics – for decades we have been studying matter that is defined as ‘in equilibrium’, such as metals and insulators. But it has been predicted that there are many more strange types of matter in the Universe that are not in equilibrium that we have not even begun to study, including the crystals of time. And now we know they are real. The fact that we now have the first example of non-equilibrium matter could lead to advances in our understanding of the world around us, as well as new technologies such as quantum computing. “This is a new phase of matter, but it’s also really cool because it’s one of the first examples of non-equilibrium matter,” said lead researcher Norman Yao of the University of California at Berkeley. “For the last fifty years we have been exploring the matter of equilibrium, like metals and insulators, and now we are beginning to explore a new landscape of matter that is not in equilibrium.” Let’s take a step back for a second, because the concept of time crystals has been floating for a few years. Previously predicted by Nobel Prize winner, the theoretical physicist Frank Wilczek, in 2012, temporal crystals are structures that appear to have movement even in their lowest energy state, known as the ground state. Normally, when a material is grounded, also known as the zero point energy of a system, it means that motion should be theoretically impossible, because that would require it to expend energy. But Wilczek predicted that this might not be the case with the crystals of time. Normal crystals have an atomic structure that repeats itself in space – just like the carbon network of a diamond. But, like a ruby ​​or a diamond, they are immobile because they are in balance in their ground state. But the crystals of time have a structure that is repeated over time, not just in space. And still oscillating in its ground state. Imagine it as jelly – when you touch it, it will repeatedly make movements. The same thing happens in the crystals of time, but the big difference here is that motion occurs without any energy. A time crystal is like jelly constantly oscillating in its natural, earthly state, and that is what makes it a completely new form of matter, that of non-equilibrium. He is unable to remain still. But one thing is to predict that these crystals of time exist, another will be to make them, which is where the new study comes in. Yao and his team have now come up with a detailed plan that describes exactly how to do and measure the properties of a time crystal, and even predict what the various phases surrounding the crystals of time should be – meaning they have plotted the equivalent of the solid, liquid and gaseous phases for the new form of matter. Published in Physical Review Letters, Yao calls the paper “the bridge between theoretical idea and experimental implementation”. And it’s not just speculation. Based on Yao’s project, two independent teams – one from the University of Maryland and one from Harvard – have followed instructions to create their own time crystals. Both developments were announced late last year on the arXiv.org prepress site (here and here), and have been submitted for publication in peer-reviewed journals. Yao is co-author of both articles. While we wait for these documents to be published, we need to be skeptical about the two statements. 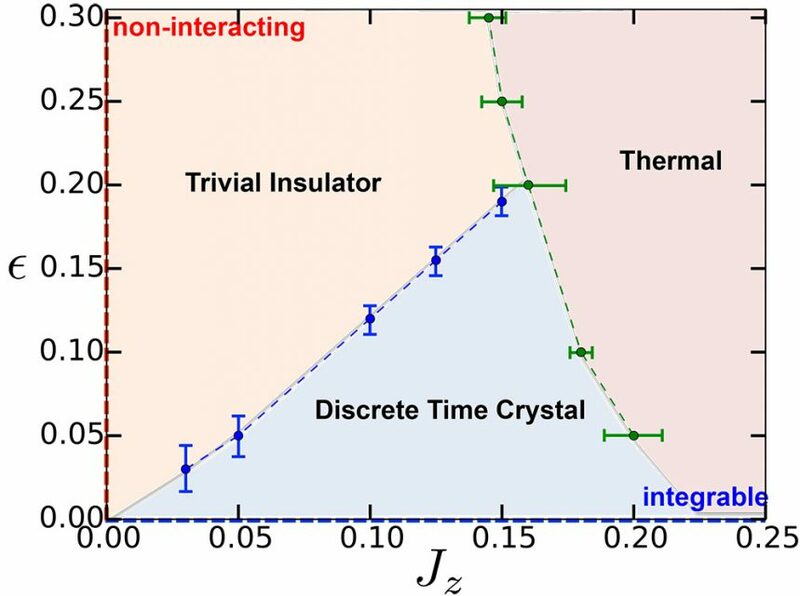 But the fact that two separate teams have used the same model to make time crystals from very different systems is promising. The time crystals of the University of Maryland were created by taking a conga line of 10 ions of ytterbium, all with entangled electrons. The key to turning that set-up into a time crystal was to keep the ions out of balance, and for that the researchers beat them alternately with two lasers. A laser created a magnetic field and the second laser partially turned the turns of the atoms. Because the twists of all atoms became entangled, the atoms settled into a stable, repetitive pattern of spin that defines a crystal. That was quite normal, but to become a time crystal, the system had to break the symmetry of time. And looking at the conga line of the ytterbium atom, the researchers noticed that he was doing something strange. The two lasers that periodically pushed the ytterbium atoms were producing a repeat in the system at twice the elbow period, something that could not happen in a normal system. Under different magnetic fields and laser pulses, the time crystal would change phase, just like a melting ice cube. Harvard’s time crystal was different. The researchers installed it using centers of nitrogen vacancies densely embedded in diamonds, but with the same result. “Observing the crystal of discrete time, confirms that the rupture of symmetry can occur in virtually all natural kingdoms, and opens the way to several new avenues of investigation.” Yao’s plan has been published in Physical Review Letters, and you can see the Harvard time glass paper here, and the University of Maryland paper here.